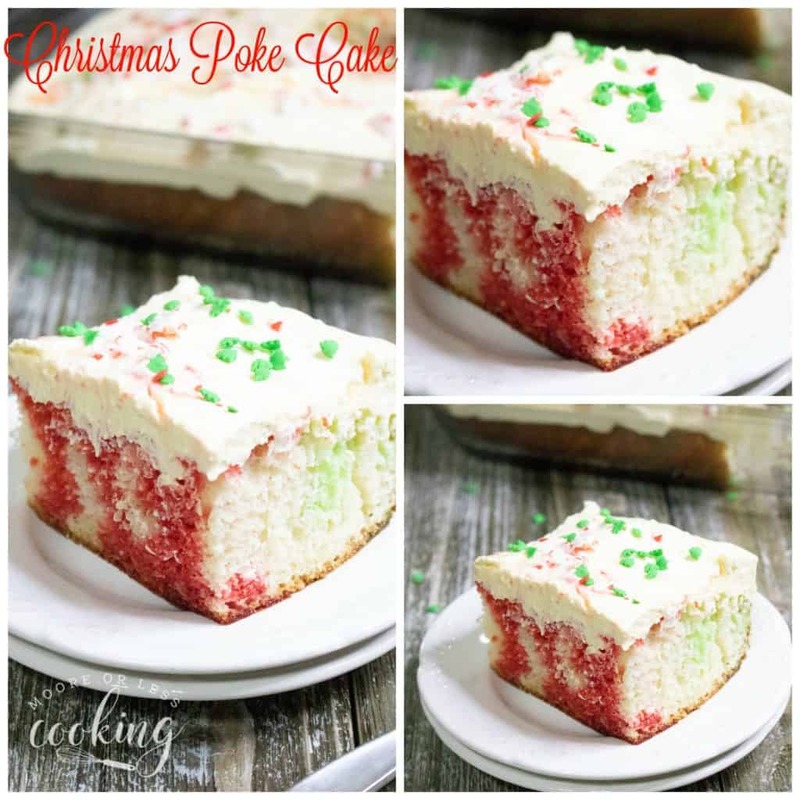 Festive and delicious Christmas Poke Cake. Delight your friends and family with this beautiful and yummy cake. My Grandmother always made the most delicious and beautiful Christmas cakes, this is her recipe. All of us cousins would gather around the cake as she sliced it, begging for the first piece. Please remember to share on Facebook and save this post to Pinterest. Everyone would say ooooh as we saw the green and red colors peek through! The gelatin mixture will only go down into the holes that you made with the fork. Jell-O poke cakes are not only festive, but they’re delicious too! This cake looks like it took a lot of effort, you will be so pleased to see how simple it is to make. 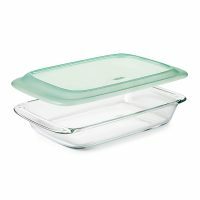 It’s perfect for a holiday gathering or potluck. It’s really snowing here in Maine which is way too early for my liking. So, I love to bake and am taking this opportunity to do so! Celebrate a special occasion with this wonderful cake! 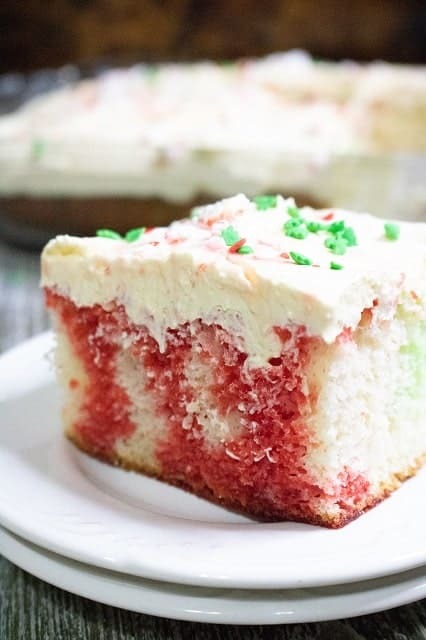 This cake uses a mix which makes a super fluffy cake! Poke holes in cake with a fork. Pour gelatin in the holes. 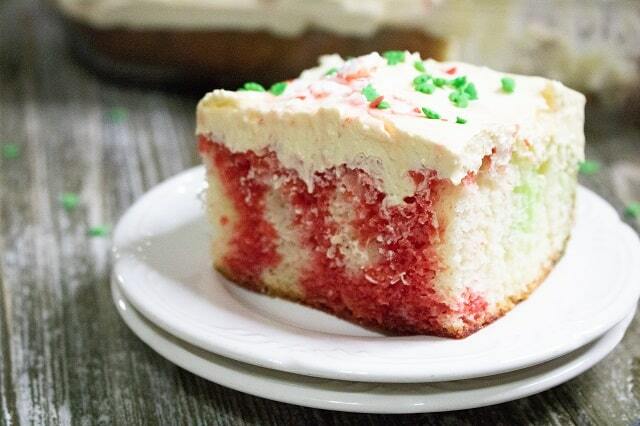 Frost cake and add sprinkles! Slice and serve! More Christmas Cakes that you will love! 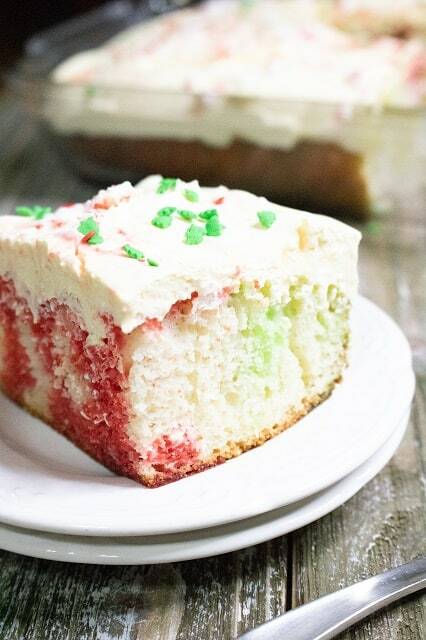 Delicious and festive Christmas Poke Cake in red and green colors! Prepare cake according to package instructions, baking in a 13x9 pan. Poke holes in cake with a fork. 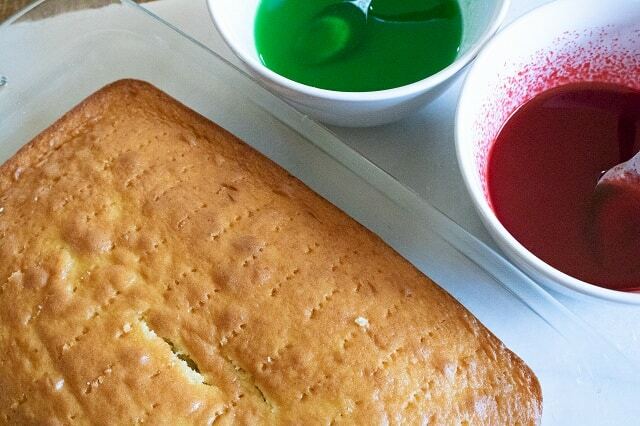 Prepare green and red gelatin separately in bowls. 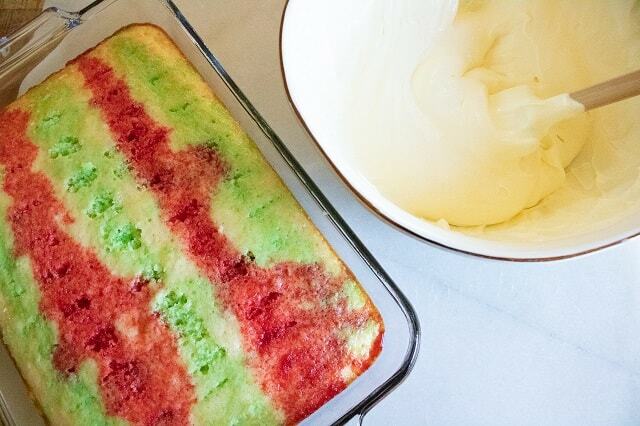 Spoon red and green over alternating sections of the cake, making stripes of red and green. Mix the pudding mix with the milk until smooth and then fold in the whipped topping. Spread this over the top of the cake. 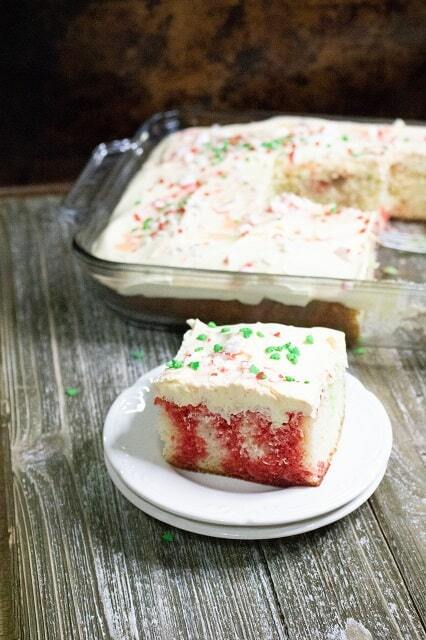 Finish with festive holiday toppings: crushed peppermint and/or red and green sprinkles. Decorate with sprinkles or crushed peppermint. Your cake is beautiful!! But you didn’t include boiling water for the gelatin. And also do you leave it in the pan while you pour the gelatin?